When the NHL playoffs came around three years ago, it marked the first time that Jarome Iginla would be entering the post-season without a Flames logo on his chest. On March 27, 2013, the long-time Calgary captain was dealt to Pittsburgh, as part of the Flames’ initial rebuild. In return for Iginla, Calgary picked up prospects Kenneth Agostino, Ben Hanowski, and a first-round pick, which the Flames used to select WHL star Morgan Klimchuk. But despite Calgary’s rebuild intentions it seems now that the trade has backfired. Three years later, Iginla is still a force in the NHL, and Calgary is still in the same spot they were when Iggy left. As one of the most beloved and respected Canadian hockey players of the generation, Jarome Iginla was the face of the Calgary Flames for almost 20 years. Iginla remains the franchise leader in games played, goals and points, and captained the Flames for nine seasons, so it’s safe to say Calgary took a huge blow by sending Iginla to the Penguins. Since leaving Calgary, Iginla has played for Pittsburgh, Boston, and Colorado, scoring 174 points in 249 games between the three teams. Iginla is currently the assistant captain in Colorado, and he’s shown minimal signs of slowing down. On the flip side, fans in Calgary knew that by giving up Iginla, it would secure the Flames’ future. But has it? Between the three forwards acquired in the Iginla trade, Agostino and Hanowski have played just 26 career NHL games combined, and Klimchuk has yet to step onto the ice with Calgary. This begs the question: if the prospects can’t even crack the main roster, did the Iginla deal accomplish anything at all? After a successful career at Yale University, Kenny Agostino was brought straight up to the Flames’ main roster in 2013-14. He played eight games with Calgary in that time, scoring one goal and adding one assist. He spent the next season in the AHL with Adirondack, and due to the Flames success, wasn’t brought back up to the main roster that year. This season, Agostino has scored 47 points in 57 games in the AHL, and played two games with the Flames in March, before being returned to the minors. Despite the fact that Agostino has played only 10 NHL games since being drafted almost 6 years ago, he may get his break soon enough. Agostino is the leading scorer for Stockton in the AHL, and will be looking for a new contract this summer when he becomes a restricted free agent. If Agostino is going to finally secure a big league spot, expect it to happen sooner rather than later. Similar to Agostino, Hanowski was brought up to the Flames’ main roster as soon as his time at St. Cloud State ended in 2012-13. Hanowski played five games with Calgary at the end of the season, and was later brought up for 11 games the following year, totalling only three points between his two NHL stints. 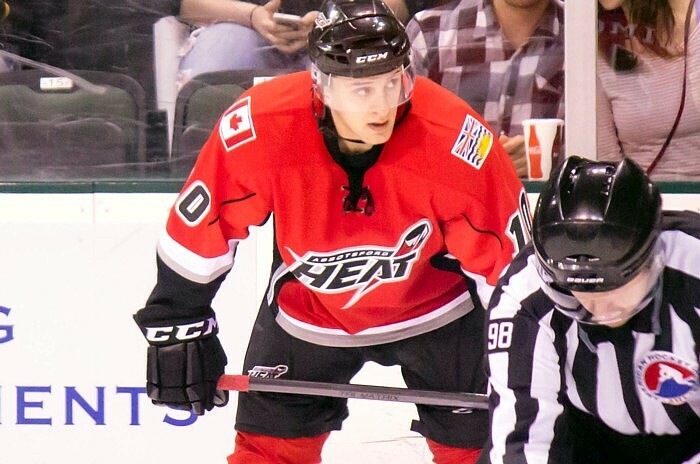 Hanowski spent the majority of his time with the Flames organization in the minors, and after putting up only 56 points in 122 games over the course of two seasons, Hanowski left to play in Germany. He is currently under contract with the Augsburger Panther of the DEL. In 2013, Calgary had reason to select Morgan Klimchuk in the first round of the NHL draft. He was averaging over a point per game in the WHL with Regina, and looked to be a stellar addition for a 28th overall pick. However, now looking at the situation, there aren’t many current NHL greats who put up only eight points in their first year in the minors. Yes, at 21 years old, Klimchuk is still very young, but considering he’s scored only one point in the AHL since January, to say his first year in the minors has been disappointing would be an understatement. He’s one of only three players selected in the first round of his draft year who is still yet to play an NHL game, and at this rate, it doesn’t look as though he’ll be starting up his career with the Flames any time soon. Right now, Calgary needs all the help they can get, and to see that sending the heart and soul of their team away accomplished nothing is disheartening. Of course, it’s been only three years since the trade, and there’s time for the prospects to develop, but as of now it doesn’t seem like Agostino or Klimchuk is in line as the next poster boy for the Flames. But who knows? Maybe Ben Hanowski will return from Germany and lead the Flames to a Cup.